I had a weak moment at the Patristics conference last week. It cost me rather a lot of money. But I succumbed to the lure of “50% off” and bought a copy of the Ashgate Research Companion to Hagiography, volume 1. 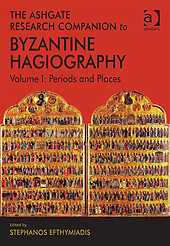 Hagiography is the most abundantly represented genre of Byzantine literature and it offers crucial insight to the development of religious thought and practice, social and literary life, and the history of the empire. It emerged in the fourth century with the pioneering Life of St Antony and continued to evolve until the end of the empire in the fifteenth century, and beyond. The appeal and dynamics of this genre radiated beyond the confines of Byzantium, and it was practised also in many Oriental and Slavic languages within the orbit of the broader Byzantine world. Contents: Introduction, Stephanos Efthymiadis; Part I The Periods of Byzantine Hagiography: The Life of St Antony between biography and hagiography, Tomas Hägg; Greek hagiography in late antiquity (4th–7th centuries), Stephanos Efthymiadis with Vincent Déroche (with contributions by André Binggeli and Zissis Aïnalis); Hagiography from the ‘dark age’ to the age of Symeon Metaphrastes (8th–10th centuries), Stephanos Efthymiadis; The hagiography of the 11th and 12th centuries, Symeon A. Paschalidis; Hagiography in late Byzantium (1204–1453), Alice-Mary Talbot. Part II The Hagiography of the Byzantine Periphery and the Christian Orient: Palestinian hagiography (4th–8th centuries), Bernard Flusin; Italo-Greek hagiography, Mario Re; Syriac hagiography, Sebastian P. Brock; Georgian hagiography, Bernadette Martin-Hisard; Armenian hagiography, S. Peter Cowe; Hagiography in Coptic, Arietta Papaconstantinou; Arabic hagiography, Mark N. Swanson; Slavic hagiography, Ingunn Lunde; Latin hagiographical literature translated into Greek, Xavier Lequeux; Indexes. I’ve started in on this. It begins with a very sensible introduction, in which the editor acknowledges the disgust that a normal historically-minded reader will tend to feel when confronted with hagiographical texts. He also adds that often there are as many versions of a hagiographical text as there are manuscripts. I have read as far as part way into the section on the Life of Anthony. It’s not bad at all. Here’s hoping that the rest is as good! But why would the normal reader be reading hagiography stories like history? They’re epic or fun stories about heroes of the faith, not histories of influential historical figures. But even if you do, surely most readers can shift back and forth between history and story. You didn’t find me complaining about the intrusion of annoying autobiographical essays into a perfectly good neurolinguistics book like St. Augustine’s Confessions (or On the Catechizing of the Unlearned, or The City of God, or any other book where the Augman hares off on a neurolinguistics/philosophy of mind path). I have different genre expectations than many other modern readers do, I guess. Although I really love the verified and witnessed wild stories best, because St. Martin de Porres teleporting an entire class of novices in workaday Peru so they wouldn’t be late for dinner, or better yet, Ven. Solanus Casey multiplying ice cream cones in a hot church office in Detroit within living memory because Jesus likes people to celebrate good news, are great foretastes of the resurrection body and fun examples of the wisdom of God being the foolishness of men. Of course, the main reason hagiography is good to read is that it gives you a good spectrum of what a holy life can be. Starving ascetic monks and rich people, scholars and ignorant newbies, peasants and merchants and knights and kings, mothers and widows and virgins and storekeepers, samurai and ninjas and jokey harpers and little kids. Whatever path you’re walking, you’re bound to find some company – and it’s a lot easier to remember legends than footnotes, when you’ve got to pull something out on the spur of the moment. Btw, you should see this: a brain analysis of fun reading versus close reading. Me for the fun! I’m with you Maureen. Genre is like a codebook that tells the reader how to understand his or her text. We don’t read a newspaper item like it’s poetry (although I would suggest some opinion columns should be read like fantasy fiction). I don’t know why therefore some people throw their brain out of the window when they read the Bible and start reading ancient Hebrew poetry like a modern scientific treatise. Anyway, I would also say hagiography is of historical interest – especially in terms of social history – as well as great for spiritual edification. Thanks for the heads up on this Roger. Well, what one Christian (ie, the writer, often many centuries later than the saint, and the general community that gave him the idea) thinks about a saint, or the idea of a saint, is certainly also part of the spectrum of what it is to live a holy life. For example, part of the reason that Fr. Damien had a hard time was that caring for lepers had fallen out of fashion, and so a lot of otherwise sane Christian people in Hawaii were totally unprepared to have some Belgian priest out at the leper colony doing stuff. People came up with all kinds of terrible stories about Fr. Damien (that polarization factor), because they just couldn’t (and wouldn’t, because it was uncomfy) see his activities as anywhere within the spectrum of what a Christian could reasonably be expected to do. Not having pictured it already, they found it easier to reject this “new” behavior. Now, I suspect that some of the problem is that back in the day, people were more likely to accept a story as having something to teach if the story took place long ago. In modern times, people have been likely to pooh-pooh old stories as if ancient people were a different species and mere modern humans not expected to do anything heroic or difficult. So they think it’s impossible to expect anyone nowadays to do any of that weird old stuff (like running a leper colony and living there oneself). Anyway, there’s my rambling, confused opinion. No, all this is interesting to those of us to whom hagiographical texts are a strange and mysterious world. Thank you all.